The Oasis 32" Single Hose Hookah is a one of a kind, being the only Hookah in The Exotic Hookah Collection that satisfies the ultimate Hookah smokers needs. This Hookah was hand crafted in the heart of Egypt, being made out of a Stainless Steel material. 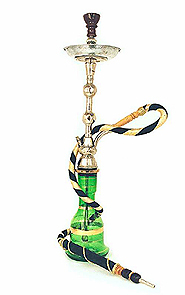 This Hookah also contains a beautiful 18kt gold plated emerald green vase. This Hookah may be used for both decorative and smoking pleasures, providing entertainment for years to come.